TACLOBAN CITY – The Province of Leyte maintained its hold on the provincial category of the regional Gawad Pamana ng Lahi (GPL) award for two years in a row. Last December 14, 2012 during the Christmas Party of the provincial government of Leyte held at the new Convention Center in the town of Palo, Governor Mimiette S. Bagulaya formally received the P3 Million cash prize and trophy from Director Pedro A. Noval Jr. of the Department of the Interior and Local Government. Aside from the trophy prepared by DILG national office, Dir. Noval, assisted by DILG-Leyte Provincial Director Artemio B. Caneja also presented Gov. Bagulaya a plaque of recognition from DILG-regional office. In revealing that Leyte was disqualified for the national award as he was a member of the national board of judges of the Gawad Pamana ng Lahi, Former Leyte Governor and now Energy Secretary Carlos Jericho L. Petilla encouraged the present administration as well as the incoming one, led by his brother Dominic who was also around, to seek next year the Gold Level award for the Seal of Good Housekeeping (SGH), which is a key criterion of the GPL. 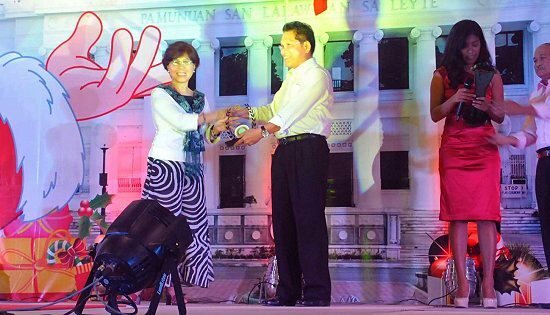 Both Governor Bagulaya and DOE Secretary Petilla offered the award to the work force of the Province of Leyte, saying the award is a reflection of the commitment and contribution of all personnel in that local government unit ( LGU). Gawad Pamana ng Lahi is considered by the DILG as the “mother of all (its) awards” as its criteria covers LGUs’ Overall Performance Index (OPI) in the agency’s Local Governance Performance Management System (LGPMS); the SGH (which recognizes transparency, accountability and inclusivity in local administration and development); International or National Awards; and acknowledged innovations. It has three categories: province, city and municipality. Leyte won over Southern Leyte, while the regional winner for the City Category is Tacloban City, which edged out Ormoc City and Maasin. No municipality in the region passed the statistical standard for the Gawad Pamana ng Lahi. GPL was initiated by the late Secretary Jesse M. Robredo as part of his incentive system for good local governance. LGPMS takes up 80% of the score, SGH 10%; while the remaining 10% is split equally for innovations and awards. The Gawad Pamana ng Lahi prize money is to be used by the local government for projects promoting disaster risk reduction and management or climate change adaptation; local economic development; or the Millennium Development Goals. CAMP SEC. RUPERTO K. KANGLEON, Palo, Leyte – The Regional Special Operations Task Group is conducting investigation if the firearms cache recovered in Calbayog City recently belongs to a Partisan Armed Group (PAG) in Samar’s first district even as a member of the Philippine Army was nabbed by police operatives in the city for carrying an undocumented firearm. “I ordered the RSOTG and the police chief in Calbayog to conduct a thorough investigation as said firearms may belong to a PAG or criminal elements in the area,” Police Chief Superintendent Elmer Ragadio Soria, Eastern Visayas director said. The Police Regional Office 8 activated the RSOTG recently to ensure secure and fair elections in 2013 especially in Samar province, which the Department of Interior and Local Government (DILG) earlier classified as one of the 15 “priority areas” for next year’s midterm polls. Soria informed that at about 9:45 in the evening of December 12, information received by the Calbayog City Police Station disclosed that there were 3 suspicious-looking men sighted infront of the Baptist Church in Purok 3, Brgy Hamorawon, some two kilometers east from the city proper. Upon cognizance of the report, police team led by Police Senior Inspector Aaron Elago immediately proceeded to the area but the men scampered towards the mountainous area of said village evading arrests after a chase by the police team. Investigation at the scene yielded a black bag containing a KG9 9mm Luger machine pistol model TEC-KG9 bearing serial number 334612 with one magazine containing 26 live ammunitions; one 9mm caliber pistol with serial number 80059 with one magazine loaded with 12 ammo and .22 caliber revolver marked Black Widow with serial number PAT 4824463 loaded with 5 ammunitions. “We are not discounting the possibility that said firearms may belong to a group that maybe utilized in next year’s polls,” Soria added, although he said that it may also belong some criminal groups operating in the city and nearby towns. “Nevertheless, such accomplishment is a welcome development in our effort to ensure peaceful elections next year,” Soria averred. The RSOTG is mandated to conduct a stepped up crackdown on PAGs and to initiate the massive drive against loose firearms especially in Samar province as the Regional Director vowed to dismantle the two remaining PAGs in said area before the campaign period starts in January next year. Meanwhile, an enlisted personnel of Philippine Army was arrested by the police in the early morning of December 14 in a nightclub in Brgy. Aguit-itan also in Calbayog City. Acting on a telephone call from one Nancy Tilos, proprietor of Moonlight Disco Club, who complained that a customer was creating trouble and refusing to pay his bills, a police team led by Police Superintendent Lope Ma. Ubaldo Lim arrested the suspect, later identified as Pfc. Andrew Biron y Ramos, 33, married, residing at Brgy San Pedro Irosin, Sorsogon and assigned at the 8th Infantry Division based in Camp Lukban in Catbalogan City. Biron failed to show any document of his authority to possess the .357 caliber Smith and Wesson revolver loaded with 5 live ammunition seized from him. Suspect was immediately brought to Calbayog Police Station for proper disposition as appropriate charges for violations of RA 8294 is being prepared for filing against him. ISABEL, Leyte – Aquasilviculture, a climate-smart and environmental-friendly agriculture will soon be showcased in Isabel, Leyte through the public-private partnership scheme that the P-Noy Administration is promoting. The establishment of a 69.33-hectare aquasilviculture project was launched with the forging of a memorandum of agreement among the Department of Environment and Natural Resources (DENR) through its Regional Executive Director Manolito Ragub, the local government unit of Isabel through its Municipal Mayor Saturnino Medina, Jr. and the Leyte Agricultural Producers Cooperative (LAPCoop) represented by its Adviser Engr. Rogelio Tantuico. Under the agreement, the project proponent LAPCoop in coordination with the LGU shall cause the establishment of the Bureau of Fisheries and Aquatic Resources (BFAR) funded aquasilviculture project in Brgys. Apale, Tolingon, and Marvel all in Isabel. The MOA with DENR legitimizes LAPCoop’s implementation of the LGU-proposed project following the suspension of the Coastal Area Special Use Agreement (CASUA), a 25-year tenurial instrument covering the development of idle and degraded areas for aquasilviculture and non-extractive activities by individuals and entities. In 2006, then DENR Secretary Angelo Reyes suspended the issuance of agreements for the special use of coastal areas to facilitate consultations with stakeholders on the CASUA guidelines. Danilo Javier, Regional Technical Director for Protected Areas Wildlife and Coastal Zone Management Service (PAWCZMS) of DENR says, the MOA permits use of the coastal area for aquasilviculture under the CASUA scheme for three (3) years, renewable for another three years, until a CASUA is in place. Five (5) hectares of the total project area shall be developed for mudcrab hatchery and all degraded areas within the proposed project site will be planted with appropriate mangrove species. Aquasilviculture is the integration of aquaculture, mudcrab culture in this case, and mangrove forestry, otherwise known as silviculture. While it is new in the Philippines, aquasilviculture has been practiced in Indonesia, Malaysia, Vietnam and China. The approaches differ among and within countries but mainly constitute the integration of mangrove ponds and pens for fish and crabs. Such systems not only sequester carbon, but they are also more resilient to shocks and extreme events and also lead to increased production due to improved ecosystem services. The advantages of this new method include low investment cost, ease of construction, protection of mangroves, and the use of locally available materials. The Aquasilviculture project in Isabel will be under the joint supervision and coordination of DENR, the LGU and BFAR. These parties shall ensure that no existing mangroves including their root system will be cut or disturbed in the implementation of the project. Thus aquasilviculture which harmonizes fishery production and reforestation in coastal areas is indeed, very noteworthy, RED Ragub said. Climate change is bringing about huge challenges to fisheries and aquaculture. Production systems and livelihoods, already in crisis from over-fishing, poor management and impacts from other terrestrial anthropogenic influences, are likely to succumb further as the frequency and intensity of storms increase and extreme weather events become more common. Fishers, as well as other community members, will be at greater risk of losing their lives and assets, such as boats, fishing equipment and aquaculture infrastructures. Aquasilviculture is among the adaptation strategies that takes into account the increased frequency and intensity of extreme events and the reduced productivity of aquatic ecosystems phenomena. 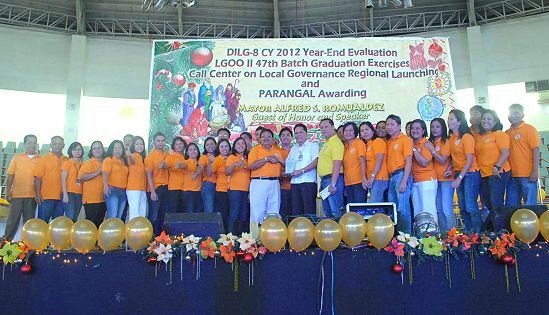 TACLOBAN CITY – DILG-Southern Leyte romped away with the major awards in the recent Yearend Evaluation of the Department of the Interior and Local Government (DILG-08) held at the Tacloban City Convention Center on December 14, 2012. Southern Leyte province was recognized during the Parangal Ceremony as Best Performing Provincial Team and Best in Annual Report, which greatly elated Provincial Director Johnny Badocdoc and his staff who were all present. Coming in at second place was Leyte province, and third was Northern Samar. The ranking was made by DILG Regional office using the field units’ performance in pursuing their program targets. Meanwhile, Tacloban City edged out Ormoc City as Best Performing City Team. A day earlier, the DILG Team of Ormoc City garnered the top award for Best Annual Report in audio-visual form during the presentation of Provincial and City Annual Reports held at the DILG-8 Local Governance Regional Resource Center (LGRRC) at the second floor of the DILG Regional Office. The revival of the “Parangal” award was envisioned by DILG-8 Regional Director Pedro A. Noval Jr. as a way to recognize achievers and encourage further productivity among employees. Director Noval in his keynote address on December 14, urged all DILG-8 personnel to be champions of good governance as espoused by the late DILG Secretary Jesse M. Robredo, as well as to dedicate themselves in following through the priorities laid out by the new DILG secretary Mar Roxas. He noted with approval the region’s high performance in implementing agency programs, which he attributed to their all-out support to the team approach which he started employing in the region to promote knowledge management and better productivity. Assistant Director Arnel M. Agabe in his welcome remarks, congratulated all personnel for contributing to the strong public satisfaction of DILG’s performance, as revealed by the recent Social Weather Station (SWS) survey on good local governance on August 2012 that was commissioned by DILG with help from Australian Aid and The Asia Foundation. In that survey, 70% were satisfied with the performance of DILG for a Very Good net satisfaction rating of +63% and seven (7%) dissatisfied. But he challenged all personnel to address the concerns of the remaining seven percent who were dissatisfied with the agency, by taking strongly advocating and explaining the department programs. Tacloban City Mayor Alfred S. Romualdez, who served as guest speaker, gave tribute to the role of DILG in strengthening the capacity of local officials in delivering basic services. This is the reason why, he said, that he committed to support the agency’s plan to put up a training center in the DILG compound. “In 2010, many newly elected punong barangays texted me that they did not know what they had gotten into, but that they would follow my leadership. So I told Dir. Noval that we must really put up training centers to address this need of local officials”, said Mayor Romualdez. The yearend evaluation likewise saw the launching of the Call Center on Local Governance, which aims to provide faster service to its clients who pose queries and information via phone. Further, the event marked the Graduation Rites for 20 Local Government Operations Officers II (LGOOs) who passed the intensive and multi-level Induction Training this year. The six-month Induction Training which is a must for one to be a full-fledged LGOO, is supervised by the DILG’s Local Government Academy (LGA) to prepare its personnel in providing technical assistance to LGUs and to respond to any eventuality involving local governance in their assigned stations. 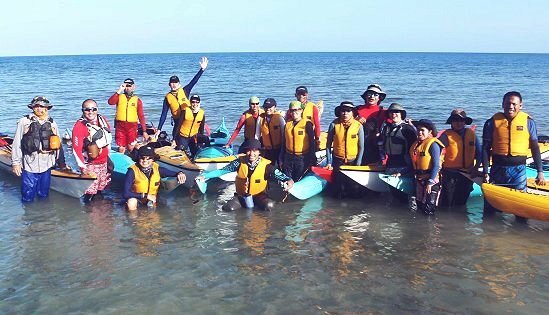 CEBU CITY – As part of the team’s development program, all 18 staff of Ramon Aboitiz Foundation Inc. (RAFI) Kool Adventure Camp (KAC) paddled the coasts of Punta Engaño, Lapu-Lapu City last Nov. 27-29. The kayak expedition was an application of the Kayak Level 1 and 2 Personal Skills Award Course conducted by the KAC senior staff who are Singapore Canoe Federation (SCF) Certified KAC Kayak Level 1 Coaches and four KAC staff who have completed the SCF Kayak 1 and 2 early this year. KAC staff who passed the recent course were Audrey Criscille Abatol, Richard de los Reyes, Daphne Dia, Marie Sol Gonzalvo, Jerome Munoz, Jose Raian Pescante, Marivic Pineda, Katrina Rosal, and Althea May Santillan. The Level 1 Kayaking Skill Award Course is designed for beginners and covers general safety and basic paddling techniques to safely maneuver a kayak on flat water, while Level 2 Kayaking Skill Award Course aims to develop confidence in the seamanship and skills of the kayaker, enough for the kayaker to embark on expeditions and be more competent in their paddling, water confidence, and preventive skills such as prevention of capsizing. Coaches were Sheerene Abrea, Peter Jay Alera, Anthony Terence Ocampo, KAC Camp Director Edvan Loh, and Leomil Urpiana. The four demonstrators were Gabriel Lamparas, Kenneth Obando Lim, Paolo Maderazo, and Landolf Villanueva. RAFI KAC offers a kayak program that aims to develop and enhance leadership skills. The program is open to both corporate professionals and youth groups. KAC is one of the programs under RAFI’s Leadership & Citizenship focus area, where future leaders are nurtured to prepare them to take an active role in affecting change. RAFI’s other focus areas are Integrated Development, Micro-finance & Entrepreneurship, Culture and Heritage, and Education. CAMP RUPERTO K. KANGLEON, Palo, Leyte – Manhunt operation teams of Police Regional Office 8 (PRO8) arrested four persons, with three facing murder charges, who are considered as dangerous in separate operations in Samar, Northern Samar and Southern Leyte provinces the past few days. Eastern Visayas police director Chief Superintendent Elmer Ragadio Soria said the arrests were made so that suspects will face the crimes they have committed and to ensure that justice would be served to their victims. “Special teams of police trackers have been deployed to go after these wanted persons aside from the Regional Special Operations Group or RSOG,” Soria said. Soria added that continuing manhunt operations will be mounted in 2013 to account for more criminal offenders wanted by the law. In Southern Leyte, murder suspect Joseph Apatan Aluta, 39, farmer, married, was nabbed by elements of Hinunangan Police Station in his hide-out in Brgy. Toptop in the morning if December 12. Aluta was arrested by virtue of an arrest warrant in Criminal Case No. 2120 at Regional Trial Court Branch 26 in San Juan, Southern Leyte. Judge Altone M Miralles did not recommend any bailbond for the temporary liberty of the suspect who was considered the Number 6 Most Wanted Person of Hinunangan. Earlier, in the morning December 10, manhunt operations by same Tracker Team in Brgy. Labrador of same town, Wilfredo Ambos Cantere alias Will, 46, farmer and the Number 5 Most Wanted Person of said town, was arrested also for murder charges. The team was clothed with an arrest warrant issued also by Judge Altone M Miralles of RTC Branch 26 in San Juan, Southern Leyte in Criminal Case 2118 with no bail recommendation. In Brgy. Lapaz, San Jorge, Samar, tracker team arrested a village councilor wanted for murder and ranked Number 6 most wanted person of said town. Romulo Reyes de la Cruz alias “Mulo”, 61, of Brgy Gerali, Gandara, Samar was nabbed in the morning of December 11 based on a warrant for his arrest issued by Judge Feliciano P Aguilar of RTC Branch 41, Gandara, Samar. De la Cruz is facing charges in criminal case number 12-0545 with no recommended bailbond. In Northern Samar, Ruel Cascano y Laurora, 29, single, jobless was arrested in his residence in Brgy Zone 1, Poblacion, Victoria town in the early morning of December 10. Cascano is ranked number 7 in the list of Most Wanted Persons in Victoria, Northern Samar and wanted for the crime of Qualified Theft in Criminal Case No. A-2522. Judge Manuel F Torrevillas of RTC Branch 23 in Allen, Northern Samar recommended P24,000.00 bailbond for his temporary liberty. Soria added that the arrested suspects were turned-over to respective courts of origin for proper disposition. QUEZON CITY – Delegates of the Trade Union Congress of the Philippines (TUCP) convention yesterday elected Victorino Balais and Gerard Seno as its new president and general-secretary respectively. Balais is the federation president of Philippine Transport and General Workers Organization (PTGWO) while Seno is executive vice president of the Associated Labor unions (ALU), the biggest labor federation in the country today. Esperanza Ocampo, president of the Philippine Government Employees Association (PGEA) was elected as treasurer. The executive board members were composed of Dolores Alegarbes, Temistocles Dejon, Concepcion Dodd, Arnel Dolendo, Edmund Estavillo, Arthur Juego, Gilbert Lorenzo, Michael Mendoza, Gerry Rivera, Cecilio Seno, Jose Suan and June Elizabeth Tanqueng. “This is the outcome of the convention called for by the TUCP constitution and by-laws. In a way we are renewing our commitment with the Filipino workers and our community. We now a fresh mandate to champion the Filipino workers and that’s exactly what we are going to do,” said Alan Tanjusay, TUCP advocacy officer. The national convention was also attended by 49 labor groups comprising the new labor coalition Nagkaisa!, and global unions federations representatives from LO Norway, SASK, Building Wood Workers International, and Public Services International (PSI). The election of the new officers effectively terminates the term of office of TUCP president Democrito Mendoza after serving the institution for 34 years. In his farewell address, he recalled how TUCP became a formidable force in shaping the Philippine Labor Code, lobbied hard for tax exemption of minimum wage earners, the observance of paternity and maternity leave, the establishment of Pag-ibig mutual fund, the annual increase in wages and the strengthening collective bargaining agreements in unions among others. “With hard work and imagination, we all made the TUCP as an institution the Filipino workers and their families can rely on,” Mendoza said. In other development, Mendoza also endorsed the candidacy of San Juan City Rep. JV Ejercito after the latter addressed the convention. “The TUCP hereby endorses the candidacy of JV for senator. When you go to your voting precincts in May 2013 elections, write down the name of JV in your ballots for senator,” said Mendoza to TUCP delegates and members in attendance. Mendoza cited the active support of Ejercito to the cause of the workers and key labor policies particularly by defending in congress the Philippine Airlines Employees Association case, authorship of the Kasambahay bill and endorsement of the pending Security of Tenure bill. “We strongly believe that JV will further support pro-workers laws and support policies advantageous to workers when he sits in the Philippine senate,” added Mendoza.